Contains the reduced form of CoQ10 known by the name of ubiquinol – by nature known as a very unstable form of CoQ10. Bio-Ubiquinol contains the reduced form of CoQ10 (ubiquinol) as Uniqinol TM - a proprietary stabilised form, by nature known as a very unstable form of CoQ10. In the body, CoQ10 is constantly changing from ubiquinone (oxidized Q10) to ubiquinol (reduced Q10) in a continuous flow in the energy production cycle, depending on whether it biochemically donates or accepts an electron. The two forms of CoQ10 act interchangeably as part of the human biochemistry, in which ubiquinone starts the cellular energy production and ubiquinol is a byproduct of the same process and thereby an important antioxidant. Ubiquinol is practically white in contrast to ubiquinone, which has a characteristic yellowish color. As soon as ubiquinol gets exposed to oxygen, it converts back into its oxidized (and yellow) form as ubiquinone. 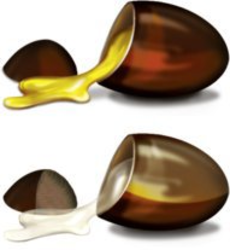 Pharma Nord has developed a special technique that protects ubiquinol inside the softgel and prevents this conversion to ubiquinone through the donation of an electron (oxidation). Bio-Ubiquinol is a strong antioxidant and helps support the body with replenishing low levels of CoQ10. Bio-Ubiquinol's safety and efficacy has been researched and documented in laboratory experiments and clinical trials. Dietary supplements with ubiquinol have one drawback, ubiquinol oxidizes once it is exposed to oxygen and thereby returns to its original form, ubiquinone. By means of a special manufacturing process, however, Pharma Nord has succeeded in encapsulating the raw material in a way that allows it to remain in its active form. Our patent-pending softgel capsules protect Bio-Ubiquinol from light and oxidation to deliver the compound in its intended form inside your body. Bio-Ubiquinol contains Q10 in vegetable oil in soft, light-proof softgels. The form of CoQ10 used in Bio-Ubiquinol is the natural, all-trans form that is entirely devoid of synthetic cis-isomers. In addition, it does not contain any pollutants that may occur in other CoQ10 raw materials as guaranteed by the pharmaceutical-grade production requirements with raw material quality assurance by Pharma Nord. Coenzyme Q10 or just CoQ10 is a fat-soluble vitamin-like substance found in two forms: ubiquinone and ubiquinol (ubi is Latin and means ”everywhere”). When a cell needs energy, it converts fat, carbohydrate, and protein, to ATP (adenosine triphosphate), a molecule that stores energy in its chemical form. The cell breaks down the ATP molecule and releases the energy trapped inside. The entire process takes place inside the cells in some small bean-shaped structures called mitochondria. CoQ10 is found in all mitochondria. Muscle cells are particularly dependent on large amounts of energy, which is why muscle cells contain substantially more mitochondria than other types of cells. The heart muscle is a good example of body tissue with cells that contain a large number of mitochondria and have a correspondingly large energy requirement. The reason why CoQ10 cannot be called a vitamin is that the body is able to synthesize it. The endogenous production of CoQ10 takes place in almost all of the body's cells. As we grow older and also as a result of certain diseases, our body’s ability to synthesize CoQ10 tapers off. Experts estimate that the body’s CoQ10 levels peak in the early twenties. From this point on, the body’s production of CoQ10 starts to decline. Although it has not been established officially, the diet is thought to provide around 5-10 mg of CoQ10 daily. The body has a CoQ10 “buffer” of around 1 to 1.5 grams. The major part of this reserve is stored in the heart, kidneys and liver. CoQ10 and cholesterol, a substance that is also produced in the liver, share the same chemical pathway. Scientific studies have shown that certain cholesterol-lowering drugs inhibit the body’s natural production of CoQ10. Studies show that even if you take CoQ10 dietary supplements of for an extended length of time it does not affect the body’s endogenous production of the compound. Some studies have used doses of up to 1,200 mg daily without any problems. More than 20 years of science support the use of Pharma Nord’s CoQ10. Ubiquinol is CoQ10 in its reduced form. In the human body, CoQ10 is available in two main chemical forms that are closely related, chemically speaking: Regular, oxidized ubiquinone and reduced ubiquinol. Once CoQ10 gets absorbed in the body, it automatically transforms back and forth from oxidized ubiquinone to reduced ubiquinol. In contrast to ubiquinone with its characteristic yellow color, ubiquinol is white. A good way to test products with ubiquinol is to pierce the capsule/softgel and squeeze out its contents. If it is white, it is ubiquinol. If it is yellow, it has been tranformed to ubiquinone. One (1) softgel capsule per day or as directed by your qualified healthcare professional. To be taken with a meal. Coconut oil, gelatin, glycerol, caramel (color), purified water, l-ascorbic acid, silicon dioxide, mixed tocopherols. Inside the body, CoQ10 is constantly switching between ubiquinone, the oxidized form of CoQ10 and ubiquinol, the reduced form. The challenge concerning ubiquinol, is that it oxidizes, when it comes into contact with oxygen. Pharma Nord has developed a special production method, that allows us to encapsulate the finished product in a completely airtight environment, which maintains the reduced form.